Influenza vaccines, also known as flu shots, are vaccines that protect against influenza. A new version of the vaccine is developed twice a year as the influenza virus rapidly changes. While their effectiveness varies from year to year, most provide modest to high protection against influenza. They decrease the number of missed days of work by a half day on average. Vaccinating children may protect those around them but the effectiveness of the vaccine in those over 65 years old is unknown because the evidence for this group is poor. Both the World Health Organization and Centers for Disease Control and Prevention recommends nearly all people over the age of 6 months get the vaccine yearly. This is especially true for pregnant women, children between six months and five years of age, those with other health problems, Native Americans, and those who work in healthcare. The vaccines are generally safe. In children fever occurs in between 5 and 10%, as may muscle pains or feeling tired. In certain years, the vaccine causes Guillain–Barré syndrome in older people in about one per million doses. It should not be given to those with severe allergies to eggs or to previous versions of the vaccine. The vaccines come in both inactive and weakened viral forms. The inactive version should be used for those who are pregnant. They come in forms that are injected into a muscle, sprayed into the nose, or injected into the middle layer of the skin. Vaccination against influenza began in the 1930s with large scale availability in the United States beginning in 1945. It is on the World Health Organization's List of Essential Medicines, the most important medications recommended for a basic health system. The wholesale price in the developing world is about 5.25 USD per dose as of 2014. In the United States it costs less than 25 USD. According to the Centers for Disease Control and Prevention, the flu vaccine is the best way to protect people against the flu and prevent its spread. The flu vaccine can also reduce the severity of the flu if a person contracts a strain of the flu that the vaccine did not contain. It takes about two weeks following vaccination for antibodies to protect against the flu. A 2012 meta-analysis found that flu shots were efficacious 67 percent of the time; the populations that benefited the most were HIV-positive adults ages 18 to 55 (76 percent), healthy adults ages 18 to 46 (approximately 70 percent), and healthy children ages 6 to 24 months (66 percent). A vaccine is assessed by its efficacy; the extent to which it reduces risk of disease under controlled conditions, and its effectiveness, the observed reduction in risk after the vaccine is put into use. In the case of influenza, effectiveness is expected to be lower than the efficacy because it is measured using the rates of influenza-like illness, which is not always caused by influenza. Influenza vaccines generally show high efficacy, as measured by the antibody production in animal models or vaccinated people. However, studies on the effectiveness of flu vaccines in the real world are difficult; vaccines may be imperfectly matched, virus prevalence varies widely between years, and influenza is often confused with other influenza-like illnesses. However, in most years (16 of the 19 years before 2007), the flu vaccine strains have been a good match for the circulating strains, and even a mismatched vaccine can often provide cross-protection. Trials of both live and inactivated influenza vaccines against seasonal influenza have been summarized in several 2012 meta-analyses. Studies on live vaccines have very limited data, but these preparations may be more effective than inactivated vaccines. The meta-analyses examined the efficacy and effectiveness of inactivated vaccines against seasonal influenza in adults, children, and the elderly. The CDC recommend that everyone except children under the age of six months should receive the seasonal influenza vaccine. Vaccination campaigns usually focus special attention on people who are at high risk of serious complications if they catch the flu, such as pregnant women, children over six months, the elderly, and people living with chronic illness or those with weakened immune systems, as well as those to whom they are exposed, such as health care workers. As the death rate is also high among infants who catch influenza, the household contacts and caregivers of infants should be vaccinated to reduce the risk of passing an influenza infection to the infant. In children, vaccines again showed high efficacy, but low effectiveness in preventing "flu-like illness". In children under the age of two the data are extremely limited, but vaccination appeared to confer no measurable benefit. In the unvaccinated, 16% get symptoms similar to the flu while about 10% of the vaccinated do. Vaccination decreased confirmed cases of influenza from about 2.4% to 1.1%. No effect on hospitalization was found. In working adults a review by the Cochrane Collaboration found that vaccination resulted in a very modest decrease in both influenza symptoms and working days lost, without affecting transmission or influenza-related complications. In healthy, working adults, influenza vaccines can provide moderate protection against virologically confirmed influenza, though such protection is greatly reduced or absent in some seasons. In health care workers, a 2006 review found a net benefit. Of the eighteen studies in this review, only two also assessed the relationship of patient mortality relative to staff influenza vaccine uptake; both found that higher rates of health care worker vaccination correlated with reduced patient deaths. A 2014 review found benefits to patients when Health Care workers are immunized supported by moderate evidence, based in part on the observed reduction in all-cause deaths in patients whose health care workers were given immunization compared with comparison patients in which the health care workers were not offered vaccine. Evidence for an effect in adults over 65 years old is unclear. Systematic reviews examining both randomized controlled and case control studies found a lack of high-quality evidence. Reviews of case control studies found effects against laboratory-confirmed influenza, pneumonia, and death among the community-dwelling elderly. The group most vulnerable to non-pandemic flu, the elderly, benefits least from the vaccine. There are multiple reasons behind this steep decline in vaccine efficacy, the most common of which are the declining immunological function and frailty associated with advanced age. In a non-pandemic year, a person in the United States aged 50–64 is nearly ten times more likely to die an influenza-associated death than a younger person, and a person over age 65 is over ten times more likely to die an influenza-associated death than the 50–64 age group. There is a new high-dose flu vaccine specifically formulated to provide a stronger immune response. Available evidence indicates that the vaccinating the elderly with the high-dose vaccine leads to a stronger immune response against influenza than the regular-dose vaccine. Vaccinating health care workers who work with elderly people is recommended in many countries, with the goal of reducing influenza outbreaks in this vulnerable population. While there is no conclusive evidence from randomized clinical trials that vaccinating health care workers helps protect the elderly people from influenza, there is tentative evidence of benefit. As well as protecting mother and child from the effects of an influenza infection, the immunization of pregnant women tends to increase their chances of experiencing a successful full-term pregnancy. The trivalent inactivated influenza vaccine is protective in pregnant women infected with HIV. While side effects of the flu vaccine may occur, they are usually minor and the safety of flu vaccines is high. The flu vaccine can cause serious side effects, including an allergic reaction, but this is rare. Furthermore, the common side effects and risks of inoculation are mild and temporary when compared to the risks and severe health effects of the annual influenza epidemic's well-documented toll of illness, hospitalization, and death. Flu vaccination may lead to side effects such as runny nose and sore throat, which can last for up to several days. Egg allergy may also be a concern, since flu vaccines are typically made using eggs; however, research into egg-allergy and influenza vaccination has led some advisory groups to recommend vaccine for those with mild allergies and monitored vaccination for those with severe. A large study of nearly 800 children in the UK with egg allergy, including over 250 with previous anaphylactic reactions had zero systemic allergic reactions when given the live attenuated flu vaccine. On January 17, 2013, the U.S. FDA approved Flublok, a faster-turnaround influenza vaccine which is the first grown in insect cells instead of eggs. Since eggs are not used in its production it avoids the problem with egg allergies. Although Guillain–Barré syndrome had been feared as a complication of vaccination, the CDC states that most studies on modern influenza vaccines have seen no link with Guillain–Barré. Infection with influenza virus itself increases both the risk of death (up to 1 in 10,000) and increases the risk of developing Guillain–Barré syndrome to a far higher level than the highest level of suspected vaccine involvement (approximately 10 times higher by 2009 estimates). Although one review gives an incidence of about one case of Guillain–Barré per million vaccinations, a large study in China, reported in The New England Journal of Medicine covering close to 100 million doses of vaccine against the 2009 H1N1 "swine" flu found only eleven cases of Guillain–Barré syndrome, (0.1 per million doses) total incidence in persons vaccinated, actually lower than the normal rate of the disease in China, and no other notable side effects; "The risk-benefit ratio, which is what vaccines and everything in medicine is about, is overwhelmingly in favor of vaccination." Several studies have identified an increased incidence of narcolepsy among recipients of the pandemic H1N1 influenza ASO3-adjuvanted vaccine, efforts to identify a mechanism for this suggest that narcolepsy is autoimmune, and that the ASO3-adjuvanted H1N1 vaccine may mimic hypocretin, serving as a trigger. Some injection-based flu vaccines intended for adults in the United States contain thiomersal (also known as thimerosal), a mercury-based preservative. Despite some controversy in the media, the World Health Organization's Global Advisory Committee on Vaccine Safety has concluded that there is no evidence of toxicity from thiomersal in vaccines and no reason on grounds of safety to change to more-expensive single-dose administration. a trivalent or quadrivalent injection (TIV or QIV), which contains the inactivated form of the virus. a nasal spray of live attenuated influenza vaccine (LAIV, Q/LAIV), which contains the attenuated or weakened form of the virus. TIV induces protection after injection (typically intramuscular, though subcutaneous and intradermal routes can also be protective) based on an immune response to the antigens present on the inactivated virus, while cold-adapted LAIV works by establishing infection in the nasal passages. people who live together in large numbers in an environment where influenza can spread rapidly, such as prisons, nursing homes, schools, and dormitories. pregnant women. However, a 2009 review concluded that there was insufficient evidence to recommend routine use of trivalent influenza vaccine during the first trimester of pregnancy. Influenza vaccination during flu season is part of recommendations for influenza vaccination of pregnant women in the United States. Both types of flu vaccines are contraindicated for those with severe allergies to egg proteins and people with a history of Guillain–Barré syndrome. Annual vaccination (or re-vaccination, if the vaccine strains are identical) is recommended, particularly for high-risk groups. other groups such as pregnant women, health care workers, those with essential functions in society, as well as children from 6 to 24 months. In the United States routine influenza vaccination is recommended for all persons aged ≥ 6 months. Vaccination is especially important for people at higher risk of serious influenza complications or people who live with or care for people at higher risk for serious complications. In 2009, a new high-dose formulation of the standard influenza vaccine was approved. The Fluzone High Dose is specifically for people 65 and older; the difference is that it has four times the antigen dose of the standard Fluzone. The U.S. government requires hospitals to report worker vaccination rates. Some U.S. states and hundreds of U.S. hospitals require health-care workers to either get vaccinations or wear masks during flu season. These requirements occasionally engender union lawsuits on narrow collective bargaining grounds, but proponents note that courts have generally endorsed forced vaccination laws affecting the general population during disease outbreaks. An added benefit expected from the vaccination of children is a reduction in the number of influenza cases among parents and other household members, and of possible spread to the general community. In USA : The CDC has indicated that live attenuated influenza vaccine (LAIV), also called the nasal spray vaccine, is not recommended for the 2016-2017 flu season, in the United States. Furthermore, health care personnel who care for severely immunocompromised persons should receive injections (TIV or QIV) rather than LAIV. In a 2010 survey of United States healthcare workers, 63.5% reported that they received the flu vaccine during the 2010–11 season, an increase from 61.9% reported the previous season. US Health professionals with direct patient contact had higher vaccination uptake, such as physicians and dentists (84.2%) and nurse practitioners (82.6%). Flu vaccine is usually grown by vaccine manufacturers in fertilized chicken eggs. In the Northern hemisphere, the manufacturing process begins following the announcement (typically in February) of the WHO recommended strains for the winter flu season. Three strains (representing an H1N1, an H3N2, and a B strain) of flu are selected and chicken eggs inoculated separately, these monovalent harvests are then combined to make the trivalent vaccine. As of November 2007, both the conventional injection and the nasal spray are manufactured using chicken eggs. The European Union has also approved Optaflu, a vaccine produced by Novartis using vats of animal cells. This technique is expected to be more scalable and avoid problems with eggs, such as allergic reactions and incompatibility with strains that affect avians like chickens. Research continues into the idea of a "universal" influenza vaccine that would not require tailoring to a particular strain, but would be effective against a broad variety of influenza viruses. However, no vaccine candidates had been announced by Nov 2007. A DNA-based vaccination, which is hoped to be even faster to manufacture, is as of 2011 in clinical trials, determining safety and efficacy. On November 20, 2012, Novartis received FDA approval for the first cell-culture vaccine. In a 2007 report, the global capacity of approximately 826 million seasonal influenza vaccine doses (inactivated and live) was double the production of 413 million doses. In an aggressive scenario of producing pandemic influenza vaccines by 2013, only 2.8 billion courses could be produced in a six-month time frame. If all high- and upper-middle-income countries sought vaccines for their entire populations in a pandemic, nearly 2 billion courses would be required. If China pursued this goal as well, more than 3 billion courses would be required to serve these populations. Vaccine research and development is ongoing to identify novel vaccine approaches that could produce much greater quantities of vaccine at a price that is affordable to the global population. Methods of vaccine generation that bypass the need for eggs include the construction of influenza virus-like particles (VLP). VLP resemble viruses, but there is no need for inactivation, as they do not include viral coding elements, but merely present antigens in a similar manner to a virion. Some methods of producing VLP include cultures of Spodoptera frugiperda Sf9 insect cells and plant-based vaccine production (e.g., production in Nicotiana benthamiana). There is evidence that some VLPs elicit antibodies that recognize a broader panel of antigenically distinct viral isolates compared to other vaccines in the hemagglutination-inhibition assay (HIA). After the 48 hour incubation period, the top of the egg is cracked and the 10 milliliters of allantoic fluid is removed, from which about 15 micrograms of the flu vaccine can be obtained. At this point, the viruses have been weakened or killed and the viral antigen is purified and placed inside vials, syringes, or nasal sprayers. Done on a large scale, this method is used to produce the flu vaccine for the human population. Each year, three strains are chosen for selection in that year's flu vaccination by the WHO Global Influenza Surveillance Network. The chosen strains are the H1N1, H3N2, and Type-B strains thought most likely to cause significant human suffering in the coming season. Starting with the 2012–2013 Northern Hemisphere influenza season (coincident with the approval of quadrivalent influenza vaccines), the WHO has also recommended a 2nd B-strain for use in quadrivalent vaccines. The World Health Organization coordinates the contents of the vaccine each year to contain the most likely strains of the virus to attack the next year. The Global Influenza Surveillance Network's selection of viruses for the vaccine manufacturing process is based on its best estimate of which strains will predominate the next year, amounting in the end to well-informed but fallible guesswork. Formal WHO recommendations were first issued in 1973. Beginning in 1999 there have been two recommendations per year: one for the northern hemisphere (N) and the other for the southern hemisphere (S). The WHO recommends that quadrivalent vaccines containing two influenza B viruses contain the above three viruses and a B/Phuket/3073/2013-like virus. WHO recommended that quadrivalent vaccines containing two influenza B viruses should contain the above three viruses and a B/Phuket/3073/2013-like virus. †Strain A(H1N1)pdm09 is a newer name for the strain used in the 2009 flu pandemic vaccine. Vaccines are used in both humans and nonhumans. Human vaccine is meant unless specifically identified as a veterinary, poultry or livestock vaccine. The first influenza pandemic was recorded in 1580. the cause of influenza, the orthomyxoviridae was discovered by the Medical Research Council (MRC) of the United Kingdom in 1933. † Because of lack of laboratory confirmation and underreporting among other factors, reported cases are "likely to be a gross underestimation of the true number of fatalities associated with the  pandemic." The 18,000 cases are those officially confirmed. Two statistical analyses, using different methods but producing similar results, estimated that the actual number was likely to be about ten times higher. In the worldwide Spanish flu pandemic of 1918, "Physicians tried everything they knew, everything they had ever heard of, from the ancient art of bleeding patients, to administering oxygen, to developing new vaccines and sera (chiefly against what we now call Hemophilus influenzae—a name derived from the fact that it was originally considered the etiological agent—and several types of pneumococci). Only one therapeutic measure, transfusing blood from recovered patients to new victims, showed any hint of success." In 1931, viral growth in embryonated hens' eggs was reported by Ernest William Goodpasture and colleagues at Vanderbilt University. The work was extended to growth of influenza virus by several workers, including Thomas Francis, Jonas Salk, Wilson Smith and Macfarlane Burnet, leading to the first experimental influenza vaccines. In the 1940s, the US military developed the first approved inactivated vaccines for influenza, which were used in the Second World War. Hen's eggs continued to be used to produce virus used in influenza vaccines, but manufacturers made improvements in the purity of the virus by developing improved processes to remove egg proteins and to reduce systemic reactivity of the vaccine. Recently, the US FDA has approved influenza vaccines made by growing virus in cell cultures and influenza vaccines made from recombinant proteins have been approved, with plant-based influenza vaccines being tested in clinical trials. According to the CDC: "Influenza vaccination is the primary method for preventing influenza and its severe complications. [...] Vaccination is associated with reductions in influenza-related respiratory illness and physician visits among all age groups, hospitalization and death among persons at high risk, otitis media among children, and work absenteeism among adults. Although influenza vaccination levels increased substantially during the 1990s, further improvements in vaccine coverage levels are needed". The egg-based technology (still in use as of 2005) for producing influenza vaccine was created in the 1950s. In the U.S. swine flu scare of 1976, President Gerald Ford was confronted with a potential swine flu pandemic. The vaccination program was rushed, yet plagued by delays and public relations problems. Meanwhile, maximum military containment efforts succeeded unexpectedly in confining the new strain to the single army base where it had originated. On that base a number of soldiers fell severely ill, but only one died. The program was canceled, after about 24% of the population had received vaccinations. An excess in deaths of twenty-five over normal annual levels as well as 400 excess hospitalizations, both from Guillain–Barré syndrome, were estimated to have occurred from the vaccination program itself, illustrating that vaccine itself is not free of risks. The result has been cited to stoke lingering doubts about vaccination. In the end, however, even the maligned 1976 vaccine may have saved lives. A 2010 study found a significantly enhanced immune response against the 2009 pandemic H1N1 in study participants who had received vaccination against the swine flu in 1976. Tom Jefferson, who has led Cochrane Collaboration reviews of flu vaccines, has called clinical evidence concerning flu vaccines "rubbish" and has therefore declared them to be ineffective; he has called for placebo-controlled randomized clinical trials. His views on clinical trials are considered unethical by mainstream medicine and his views on the efficacy of vaccines are rejected by medical institutions including the CDC and the WHO, and by key figures in the field like Anthony Fauci. The cost-effectiveness of seasonal influenza vaccination has been widely evaluated for different groups and in different settings. In the elderly (aged over 65 years) the majority of published studies have found that vaccination is cost saving, with the cost savings associated with influenza vaccination (e.g. prevented health care visits) outweighing the cost of vaccination. In older adults (aged 50–64 years), several published studies have found that influenza vaccination is likely to be cost-effective, however the results of these studies were often found to be dependent on key assumptions used in the economic evaluations. The uncertainty in influenza cost-effectiveness models can partially be explained by the complexities involved in estimating the disease burden, as well as the seasonal variability in the circulating strains and the match of the vaccine. In healthy working adults (aged 18–49 years), a 2012 review found that vaccination was generally not cost-saving, with the suitability for funding being dependent on the willingness to pay to obtain the associated health benefits. In children, the majority of studies have found that influenza vaccination was cost-effective, however many of the studies included (indirect) productivity gains, which may not be given the same weight in all settings. Several studies have attempted to predict the cost-effectiveness of interventions (including prepandemic vaccination) to help protect against a future pandemic, however estimating the cost-effectiveness has been complicated by uncertainty as to the severity of a potential future pandemic and the efficacy of measures against it. Influenza research includes molecular virology, molecular evolution, pathogenesis, host immune responses, genomics, and epidemiology. These help in developing influenza countermeasures such as vaccines, therapies and diagnostic tools. Improved influenza countermeasures require basic research on how viruses enter cells, replicate, mutate, evolve into new strains and induce an immune response. The Influenza Genome Sequencing Project is creating a library of influenza sequences that will help us understand what makes one strain more lethal than another, what genetic determinants most affect immunogenicity, and how the virus evolves over time. Solutions to limitations in current vaccine methods are being researched. A different approach is where Internet content is used to estimate the impact of an influenza vaccination campaign. More specifically, researchers have used data from Twitter and Bing, and proposed a statistical framework which, after a series of operations, maps this information to estimates of the percentage of influenza-like illness in areas, where vaccinations have been performed. Their impact estimates were in accordance with estimations from Public Health England. The rapid development, production, and distribution of pandemic influenza vaccines could potentially save millions of lives during an influenza pandemic. Due to the short time frame between identification of a pandemic strain and need for vaccination, researchers are looking at novel technologies for vaccine production that could provide better "real-time" access and be produced more affordably, thereby increasing access for people living in low- and moderate-income countries, where an influenza pandemic may likely originate, such as live attenuated (egg-based or cell-based) technology and recombinant technologies (proteins and virus-like particles). As of July 2009, more than 70 known clinical trials have been completed or are ongoing for pandemic influenza vaccines. In September 2009, the US Food and Drug Administration approved four vaccines against the 2009 H1N1 influenza virus (the 2009 pandemic strain), and expected the initial vaccine lots to be available within the following month. A quadrivalent flu vaccine administered by nasal mist was approved by the U.S. Food and Drug Administration (FDA) in March 2012. Fluarix Quadrivalent was approved by the FDA in December 2012. A "universal vaccine" that would not have to be designed and made for each flu season in each hemisphere would be useful, in order to stabilize the supply and to ensure against error in the design or escape of the circulating strains by mutation. Such a vaccine has been the subject of research for decades. One promising approach is using broadly neutralizing antibodies that unlike the vaccine used today, which provoke the body to generate an immune response, instead provide a component of the immune response itself. The first neutralizing antibodies were identified in 1993 via experimentation; with time researchers understood that the flu neutralizing antibodies were binding to the stalk of the Hemagglutinin protein; later researchers identified antibodies that could bind to the head of those proteins. Later yet, researchers identified the highly conserved M2 proton channel as a potential target for broadly neutralizing antibodies. The challenges for researchers have been identifying single antibodies that could neutralize many subtypes of the virus, so that they could be useful in any season, and that target conserved domains that are resistant to antigenic drift. Another approach has been taking the conserved domains identified from these projects, and delivering groups of these antigens to provoke an immune response; various approaches with different antigens, presented different ways (as fusion proteins, mounted on virus-like particles, on non-pathogenic viruses, as DNA, and others), are under development. Efforts have also been undertaken to develop universal vaccines that specifically activate a T-cell response, based on clinical data showing that people with a strong, early T-cell response have better outcomes when infected with influenza and because T-cells respond to conserved epitopes. The challenge for developers is that these epitopes are on internal protein domains that are only mildly immunogenic. Along with the rest of the vaccine field, people working on universal vaccines have been experimenting with vaccine adjuvants to improve the ability of their vaccines to create a sufficiently powerful and enduring immune response. "Vaccination in the veterinary world pursues four goals: (i) protection from clinical disease, (ii) protection from infection with virulent virus, (iii) protection from virus excretion, and (iv) serological differentiation of infected from vaccinated animals (so-called DIVA principle). In the field of influenza vaccination, neither commercially available nor experimentally tested vaccines have been shown so far to fulfill all of these requirements." Horses with horse flu can run a fever, have a dry hacking cough, have a runny nose, and become depressed and reluctant to eat or drink for several days but usually recover in two to three weeks. "Vaccination schedules generally require a primary course of 2 doses, 3–6 weeks apart, followed by boosters at 6–12 month intervals. It is generally recognized that in many cases such schedules may not maintain protective levels of antibody and more frequent administration is advised in high-risk situations." It is a common requirement at shows in the United Kingdom that horses be vaccinated against equine flu and a vaccination card must be produced; the International Federation for Equestrian Sports (FEI) requires vaccination every six months. Poultry vaccines for bird flu are made inexpensively and are not filtered and purified like human vaccines to remove bits of bacteria or other viruses. They usually contain whole virus, not just hemagglutinin as in most human flu vaccines. Purification to standards needed for humans is far more expensive than the original creation of the unpurified vaccine from eggs. There is no market for veterinary vaccines that are that expensive. Another difference between human and poultry vaccines is that poultry vaccines are adjuvated with mineral oil, which induces a strong immune reaction but can cause inflammation and abscesses. "Chicken vaccinators who have accidentally jabbed themselves have developed painful swollen fingers or even lost thumbs, doctors said. Effectiveness may also be limited. Chicken vaccines are often only vaguely similar to circulating flu strains — some contain an H5N2 strain isolated in Mexico years ago. 'With a chicken, if you use a vaccine that's only 85 percent related, you'll get protection,' Dr. Cardona said. 'In humans, you can get a single point mutation, and a vaccine that's 99.99 percent related won't protect you.' And they are weaker [than human vaccines]. 'Chickens are smaller and you only need to protect them for six weeks, because that's how long they live till you eat them,' said Dr. John J. Treanor, a vaccine expert at the University of Rochester. Human seasonal flu vaccines contain about 45 micrograms of antigen, while an experimental A(H5N1) vaccine contains 180. Chicken vaccines may contain less than 1 microgram. 'You have to be careful about extrapolating data from poultry to humans,' warned Dr. David E. Swayne, director of the agriculture department's Southeast Poultry Research Laboratory. 'Birds are more closely related to dinosaurs.'" Researchers, led by Nicholas Savill of the University of Edinburgh in Scotland, used mathematical models to simulate the spread of H5N1 and concluded that "at least 95 percent of birds need to be protected to prevent the virus spreading silently. In practice, it is difficult to protect more than 90 percent of a flock; protection levels achieved by a vaccine are usually much lower than this." The Food and Agriculture Organization of the United Nations has issued recommendations on the prevention and control of avian influenza in poultry, including the use of vaccination. Swine influenza has been recognized as a greater problem since the outbreak in 1976. Evolution of the virus has resulted in inconsistent responses to traditional vaccines. Standard commercial swine origin flu vaccines are effective in controlling the problem when the virus strains match enough to have significant cross-protection and custom (autogenous) vaccines made from the specific viruses isolated are created and used in the more difficult cases. SoIV vaccine manufacture Novartis paints this picture: "A strain of swine origin influenza virus (SoIV) called H3N2, first identified in the US in 1998, has brought exasperating production losses to swine producers. Abortion storms are a common sign. Sows go off feed for two or three days and run a fever up to 106 °F (41 °C). Mortality in a naïve herd can run as high as 15%." 1 2 "Influenza Virus Vaccine Inactivated". The American Society of Health-System Pharmacists. Retrieved Jan 8, 2015. 1 2 3 4 5 6 7 "Vaccines against influenza WHO position paper – November 2012." (PDF). Wkly Epidemiol Rec. 87 (46): 461–76. Nov 23, 2012. PMID 23210147. ↑ Manzoli L, Ioannidis JP, Flacco ME, De Vito C, Villari P (July 2012). "Effectiveness and harms of seasonal and pandemic influenza vaccines in children, adults and elderly: a critical review and re-analysis of 15 meta-analyses". Hum Vaccin Immunother. 8 (7): 851–62. doi:10.4161/hv.19917. PMC 3495721 . PMID 22777099. 1 2 3 4 5 6 7 Jefferson, T; Di Pietrantonj, C; Rivetti, A; Bawazeer, GA; Al-Ansary, LA; Ferroni, E (13 March 2014). "Vaccines for preventing influenza in healthy adults.". The Cochrane database of systematic reviews. 3: CD001269. doi:10.1002/14651858.CD001269.pub5. PMID 24623315. 1 2 3 Osterholm, MT; Kelley, NS; Sommer, A; Belongia, EA (Jan 2012). "Efficacy and effectiveness of influenza vaccines: a systematic review and meta-analysis.". The Lancet. Infectious diseases. 12 (1): 36–44. doi:10.1016/S1473-3099(11)70295-X. PMID 22032844. ↑ Jefferson, T; Di Pietrantonj, C; Al-Ansary, LA; Ferroni, E; Thorning, S; Thomas, RE (Feb 17, 2010). "Vaccines for preventing influenza in the elderly". The Cochrane database of systematic reviews (2): CD004876. doi:10.1002/14651858.CD004876.pub3. PMID 20166072. 1 2 3 "Who Should Get Vaccinated Against Influenza". U.S. Centers for Disease Control and Prevention. 2015-11-04. Retrieved 2015-12-08. ↑ Grohskopf, Lisa A.; Sokolow, Leslie Z.; Broder, Karen R.; Olsen, Sonja J.; Karron, Ruth A.; Jernigan, Daniel B.; Bresee, Joseph S. (26 August 2016). "Prevention and Control of Seasonal Influenza with Vaccines". MMWR. Recommendations and reports: Morbidity and mortality weekly report. Recommendations and reports. 65 (5): 1–54. doi:10.15585/mmwr.rr6505a1. ISSN 1545-8601. PMID 27560619. ↑ Compans, Richard W. (2009). Vaccines for pandemic influenza. Dordrecht: Springer. p. 49. ISBN 9783540921653. ↑ Vaccine Analysis: Strategies, Principles, and Control. Springer. 2014. p. 61. ISBN 9783662450246. ↑ "Vaccine, influenza". International Drug Price Indicator Guide. Retrieved 6 December 2015. ↑ Center for Disease Control and Prevention. "Key Facts About Seasonal Flu Vaccine". Retrieved 7 February 2013. ↑ "Key Facts About Seasonal Flu Vaccine"
↑ Osterholm, MT; Kelley, NS; Sommer, A; Belongia, EA (January 2012). "Efficacy and effectiveness of influenza vaccines: a systematic review and meta-analysis.". The Lancet. Infectious diseases. 12 (1): 36–44. doi:10.1016/s1473-3099(11)70295-x. PMID 22032844. ↑ Fedson DS (1998). "Measuring protection: efficacy versus effectiveness". Dev Biol Stand. 95: 195–201. PMID 9855432. ↑ Stephenson, I.; Zambon, M. C.; Rudin, A.; Colegate, A.; Podda, A.; Bugarini, R.; Del Giudice, G.; Minutello, A.; et al. (May 2006). "Phase I Evaluation of Intranasal Trivalent Inactivated Influenza Vaccine with Nontoxigenic Escherichia coli Enterotoxin and Novel Biovector as Mucosal Adjuvants, Using Adult Volunteers". J Virol. 80 (10): 4962–70. doi:10.1128/JVI.80.10.4962-4970.2006. PMC 1472052 . PMID 16641287. ↑ Jefferson, T. (October 2006). "Influenza vaccination: policy versus evidence". BMJ. 333 (7574): 912–5. doi:10.1136/bmj.38995.531701.80. PMC 1626345 . PMID 17068038. ↑ Treanor, J.; Kotloff, K.; Betts, R.; Belshe, R.; Newman, F.; Iacuzio, D.; Wittes, J.; Bryant, M. (December 1999). "Evaluation of trivalent, live, cold-adapted (CAIV-T) and inactivated (TIV) influenza vaccines in prevention of virus infection and illness following challenge of adults with wild-type influenza A (H1N1), A (H3N2), and B viruses". Vaccine. 18 (9–10): 899–906. doi:10.1016/S0264-410X(99)00334-5. PMID 10580204. 1 2 3 Jefferson T, Rivetti A, Di Pietrantonj C, Demicheli V, Ferroni E (2012). "Vaccines for preventing influenza in healthy children". Cochrane Database Syst Rev. 8: CD004879. doi:10.1002/14651858.CD004879.pub4. PMID 22895945. ↑ Jefferson T, Di Pietrantonj C, Al-Ansary LA, Ferroni E, Thorning S, Thomas RE (2010). "Vaccines for preventing influenza in the elderly". Cochrane Database Syst Rev (2): CD004876. doi:10.1002/14651858.CD004876.pub3. PMID 20166072. ↑ Jefferson T, Rivetti D, Rivetti A, Rudin M, Di Pietrantonj C, Demicheli V (2005). "Efficacy and effectiveness of influenza vaccines in elderly people: a systematic review". Lancet. 366 (9492): 1165–74. doi:10.1016/S0140-6736(05)67339-4. PMID 16198765. 1 2 Burls, A; Jordan, R; Barton, P; Olowokure, B; Wake, B; Albon, E; Hawker, J (8 May 2006). "Vaccinating healthcare workers against influenza to protect the vulnerable--is it a good use of healthcare resources? A systematic review of the evidence and an economic evaluation.". Vaccine. 24 (19): 4212–21. doi:10.1016/j.vaccine.2005.12.043. PMID 16546308. ↑ "Effect of influenza vaccination of healthcare personnel on morbidity and mortality among patients: systematic review and grading of evidence". Clin Infect Dis. 58 (1): 50–57. 2014. doi:10.1093/cid/cit580. PMID 24046301. ↑ Simonsen L, Viboud C, Taylor RJ, Miller MA, Jackson L (October 2009). "Influenza vaccination and mortality benefits: new insights, new opportunities". Vaccine. 27 (45): 6300–4. doi:10.1016/j.vaccine.2009.07.008. PMID 19840664. ↑ Jefferson, T; Di Pietrantonj, C; Al-Ansary, LA; Ferroni, E; Thorning, S; Thomas, RE (17 February 2010). "Vaccines for preventing influenza in the elderly.". The Cochrane database of systematic reviews (2): CD004876. doi:10.1002/14651858.CD004876.pub3. PMID 20166072. ↑ Darvishian, M; Bijlsma, MJ; Hak, E; van den Heuvel, ER (December 2014). "Effectiveness of seasonal influenza vaccine in community-dwelling elderly people: a meta-analysis of test-negative design case-control studies.". The Lancet. Infectious diseases. 14 (12): 1228–39. doi:10.1016/S1473-3099(14)70960-0. PMID 25455990. ↑ Nichol, K.L. ; Nordin, J.D. ; Nelson, D.B. ; Mullooly, J.D. ; Hak, E. (2007). "Effectiveness of Influenza Vaccine in the community-dwelling elderly". The New England Journal of Medicine. 357 (14): 1373–1381. doi:10.1056/NEJMoa070844. PMID 17914038. ↑ Simonsen, L.; Taylor, R.J.; Viboud, C.; Miller, M.A. ; Jackson, L.A. (2007). "Mortality benefits of influenza vaccination in elderly people: An ongoing controversy". The Lancet Infectious Diseases. 7 (10): 658–666. doi:10.1016/S1473-3099(07)70236-0. PMID 17897608. ↑ Thompson WW, Shay DK, Weintraub E, Brammer L, Cox N, Anderson LJ, Fukuda K (2003). "Mortality associated with influenza and respiratory syncytial virus in the United States". The Journal of the American Medical Association. 289 (2): 179–186. doi:10.1001/jama.289.2.179. PMID 12517228. ↑ "High Dose Flu Vaccine for the Elderly « Science-Based Medicine". Sciencebasedmedicine.org. Retrieved October 17, 2013. ↑ "CDC – Seasonal Influenza (Flu) – Q & A: Fluzone High-Dose Seasonal Influenza Vaccine". Cdc.gov. August 13, 2013. Retrieved October 17, 2013. ↑ Haverkate, M.; D'Ancona, F.; Giambi, C.; Johansen, K.; Lopalco, P. L.; Cozza, V.; Appelgren, E.; VENICE project gatekeepers and contact points (2012-05-31). "Mandatory and recommended vaccination in the EU, Iceland and Norway: results of the VENICE 2010 survey on the ways of implementing national vaccination programmes". Euro Surveillance: Bulletin Europeen Sur Les Maladies Transmissibles = European Communicable Disease Bulletin. 17 (22). ISSN 1560-7917. PMID 22687916. ↑ Field, Robert I. (2016-11-26). "Mandatory Vaccination of Health Care Workers". Pharmacy and Therapeutics. 34 (11): 615–618. ISSN 1052-1372. PMC 2810172 . PMID 20140133. ↑ Kassianos, George (2015-01-21). "Willingness of European healthcare workers to undergo vaccination against seasonal influenza: current situation and suggestions for improvement". Drugs in Context. 4. doi:10.7573/dic.212268. ISSN 1745-1981. PMC 4316812 . PMID 25657810. ↑ Thomas, Roger E.; Jefferson, Tom; Lasserson, Toby J. (2016-06-02). "Influenza vaccination for healthcare workers who care for people aged 60 or older living in long-term care institutions". The Cochrane Database of Systematic Reviews (6): CD005187. doi:10.1002/14651858.CD005187.pub5. ISSN 1469-493X. PMID 27251461. ↑ Fell, Deshayne B.; Sprague, Ann E.; Liu, Ning; Yasseen, Abdool S.; Wen, Shi-Wu; Smith, Graeme; Walker, Mark C. (June 2012). "H1N1 Influenza Vaccination During Pregnancy and Fetal and Neonatal Outcomes". American Journal of Public Health. 102 (6): e33–e40. doi:10.2105/AJPH.2011.300606. ↑ Madhi, Shabir A.; Cutland, Clare L.; Kuwanda, Locadiah; Weinberg, Adriana; Hugo, Andrea; Jones, Stephanie; Adrian, Peter V.; van Niekerk, Nadia; Treurnicht, Florette; Ortiz, Justin R.; Venter, Marietjie; Violari, Avy; Neuzil, Kathleen M.; Simões, Eric A.F. ; Klugman, Keith P.; Nunes, Marta C. (2014). "Influenza Vaccination of Pregnant Women and Protection of Their Infants". New England Journal of Medicine. 371 (10): 918–931. doi:10.1056/NEJMoa1401480. ISSN 0028-4793. ↑ "Key Facts About Seasonal Flu Vaccine". cdc.gov. Center for Disease Control. Retrieved 26 September 2014. ↑ Gagnon, R; Primeau MN; Des Roches A; Lemire C; Kagan R; Carr S; Ouakki M; Benoît M; De Serres G (August 2010). "Safe vaccination of patients with egg allergy with an adjuvanted pandemic H1N1 vaccine.". The Journal of Allergy and Clinical Immunology. 126 (2): 317–323. doi:10.1016/j.jaci.2010.05.037. PMID 20579720. ↑ National Advisory Committee on Immunization (August 2012). "Statement on Seasonal Influenza Vaccine for 2012–2013" (PDF). Canadian Communicable Disease Report. 38. Retrieved 18 July 2013. ↑ Turner, Paul J.; Southern, Jo; Andrews, Nick J.; Miller, Elizabeth; Erlewyn-Lajeunesse, Michel (2015-12-08). "Safety of live attenuated influenza vaccine in young people with egg allergy: multicentre prospective cohort study". BMJ. 351: h6291. doi:10.1136/bmj.h6291. ISSN 1756-1833. PMC 4673102 . PMID 26645895. ↑ Greenhawt, Matthew (2015-12-09). "Live attenuated influenza vaccine for children with egg allergy". BMJ. 351: h6656. doi:10.1136/bmj.h6656. ISSN 1756-1833. PMID 26657778. ↑ Haber P, Sejvar J, Mikaeloff Y, DeStefano F (2009). "Vaccines and Guillain–Barré syndrome". Drug Safety. 32 (4): 309–23. doi:10.2165/00002018-200932040-00005. PMID 19388722. ↑ Kaplan JE, Katona P, Hurwitz ES, Schonberger LB (August 1982). "Guillain–Barré syndrome in the United States, 1979–1980 and 1980–1981. Lack of an association with influenza vaccination". JAMA. 248 (6): 698–700. doi:10.1001/jama.248.6.698. PMID 7097920. ↑ Stowe J, Andrews N, Wise L, Miller E (February 2009). "Investigation of the temporal association of Guillain–Barré syndrome with influenza vaccine and influenzalike illness using the United Kingdom General Practice Research Database". Am. J. Epidemiol. 169 (3): 382–8. doi:10.1093/aje/kwn310. PMID 19033158. ↑ Sivadon-Tardy V; Orlikowski, David; Porcher, Raphaël; Sharshar, Tarek; Durand, Marie‐Christine; Enouf, Vincent; Rozenberg, Flore; Caudie, Christiane; Annane, Djillali; Van Der Werf, Sylvie; Lebon, Pierre; Raphaël, Jean‐Claude; Gaillard, Jean‐Louis; Gault, Elyanne (January 2009). "Guillain–Barré syndrome and influenza virus infection". Clin. Infect. Dis. 48 (1): 48–56. doi:10.1086/594124. PMID 19025491. ↑ Vellozzi C, Burwen DR, Dobardzic A, Ball R, Walton K, Haber P (March 2009). "Safety of trivalent inactivated influenza vaccines in adults: Background for pandemic influenza vaccine safety monitoring". Vaccine. 27 (15): 2114–2120. doi:10.1016/j.vaccine.2009.01.125. PMID 19356614. ↑ Steven Reinberg (February 2, 2011). 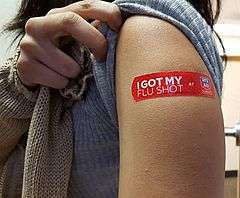 "Last Year's H1N1 Flu Vaccine Was Safe, Study Finds". U.S. News & World Report. ↑ Sivadon-Tardy V, Orlikowski D, Porcher R, et al. (January 2009). "Guillain–Barré syndrome and influenza virus infection". Clinical Infectious Diseases. 48 (1): 48–56. doi:10.1086/594124. PMID 19025491. ↑ TECHNICAL REPORT: Narcolepsy in association with pandemic influenza vaccination (PDF). Stockholm, Sweden: European Centre for Disease Prevention and Contro. 2012. ISBN 978-92-9193-388-4. ↑ Yong, Ed (18 December 2013). "Narcolepsy confirmed as autoimmune disease". Nature. doi:10.1038/nature.2013.14413. ↑ Offit PA (September 2007). "Thimerosal and vaccines—a cautionary tale". N Engl J Med (PDF)|format= requires |url= (help). 357 (13): 1278–9. doi:10.1056/NEJMp078187. PMID 17898096. ↑ Global Advisory Committee on Vaccine Safety (2006-07-14). "Thiomersal and vaccines". World Health Organization. Retrieved 2007-11-20. ↑ Plotkin & Mortimer (1988). Vaccines. Philadelphia: W.B. Saunders Company. ISBN 0-7216-1946-0. ↑ To, K.W. ; Lai, A.; Lee, K.C.K. ; Koh, D.; Lee, S.S. (October 2016). "Increasing the coverage of influenza vaccination in healthcare workers: review of challenges and solutions". Journal of Hospital Infection. 94 (2): 133–142. doi:10.1016/j.jhin.2016.07.003. PMID 27546456. ↑ Skowronski DM, De Serres G (2009). "Is routine influenza immunization warranted in early pregnancy?". Vaccine. 27 (35): 4754–70. doi:10.1016/j.vaccine.2009.03.079. PMID 19515466. ↑ "WHO | World Health Organization". Who.int. Retrieved 2014-07-24. ↑ "U.S. panel recommends all kids get the flu shot". CTV. February 27, 2008. In Canada, the National Advisory Committee on Immunization (NACI), the group that advises the Public Health Agency of Canada, currently says that children between the age of six and 24 months should be considered a high priority for the flu vaccine. ↑ "Statement on Seasonal Influenza Vaccine for 2013–2014 – CCDR Vol.39 ACS-4 – Public Health Agency of Canada". Phac-aspc.gc.ca. 2013-11-14. Retrieved 2014-07-24. 1 2 Fiore, AE; Uyeki; Broder, K; Finelli, L; Euler, GL; Singleton, JA; Iskander, JK; Wortley, PM; et al. (August 2010). "Prevention and control of influenza with vaccines: recommendations of the Advisory Committee on Immunization Practices (ACIP), 2010" (PDF). MMWR Recomm Rep. 59 (RR–8): 1–62. PMID 20689501. ↑ "Prevention and control of influenza with vaccines: recommendations of the Advisory Committee on Immunization Practices (ACIP) – United States, 2012–13 influenza season" (PDF). MMWR Morb. Mortal. Wkly. Rep. 61 (32): 613–8. August 2012. ISSN 0149-2195. PMID 22895385. ↑ "Children, the Flu, and the Flu Vaccine"
↑ "Who Should Get Vaccinated Against Influenza". Centers for Disease Control. Retrieved 14 January 2014. ↑ Couch, Robert B.; Patricia Winokur; Rebecca Brady; Robert Belshe; Wilbur H. Chen; Thomas R. Cate; Bryndis Sigurdardottir; Amy Hoeper; Irene L. Graham; Robert Edelman; Fenhua He; Diane Nino; Jose Capellan; Frederick L. Ruben (1 November 2007). "Safety and immunogenicity of a high dosage trivalent influenza vaccine among elderly subjects". Vaccine. 25 (44): 7656–7663. doi:10.1016/j.vaccine.2007.08.042. ↑ Tanner, Lindsey (2013-01-13). "Hospitals crack down on workers who refuse flu shots". NBC News. Retrieved 2014-07-24. ↑ Fiore, AE; Shay, DK; Broder, K; Iskander, JK; Uyeki, TM; Mootrey, G; Bresee, JS; Cox, NJ; Centers for Disease Control and Prevention (2009). "Prevention and control of seasonal influenza with vaccines: recommendations of the Advisory Committee on Immunization Practices (ACIP), 2009" (PDF). MMWR Recomm Rep. 58 (RR–8): 1–52. PMID 19644442. Annual vaccination of all children aged 6 months – 18 years should begin as soon as the 2009–10 influenza vaccine is available. Annual vaccination of all children aged 6 months – 4 years (59 months) and older children with conditions that place them at increased risk for complications from influenza should continue to be a primary focus of vaccination efforts as providers and programs transition to routinely vaccinating all children. 1 2 Altman, Lawrence K. (February 28, 2008). "Panel Advises Flu Shots for Children Up to Age 18". The New York Times. ↑ "CDC Press Releases". CDC. Retrieved 2016-11-26. ↑ "Immunization Schedules". CDC. Center for Disease Control and Prevention. Retrieved 4 November 2014. ↑ "Influenza vaccination coverage among health-care personnel: 2011–12 influenza season, United States" (PDF). MMWR Morb. Mortal. Wkly. Rep. 61 (38): 753–7. September 2012. ISSN 0149-2195. PMID 23013720. 1 2 3 4 5 New and Old Ways to Make Flu Vaccines, November 8, 2007, National Public Radio. ↑ "Recommendations for the production and control of influenza vaccine (inactivated)" (PDF). World Health Organization. Retrieved 27 May 2013. ↑ "Priming with DNA vaccine makes avian flu vaccine work better (NIH News)". October 3, 2011. ↑ "Novartis receives FDA approval for Flucelvax, the first cell-culture vaccine in US to help protect against seasonal influenza" (Press release). Novartis. November 20, 2012. ↑ "FDA approves first seasonal influenza vaccine manufactured using cell culture technology"
↑ "November 20, 2012 Approval Letter- Flucelvax"
↑ Bright, R. A.; Carter, D. M.; Daniluk, S.; Toapanta, F. R.; Ahmad, A.; Gavrilov, V.; Massare, M.; Pushko, P.; et al. (May 2007). "Influenza virus-like particles elicit broader immune responses than whole virion inactivated influenza virus or recombinant hemagglutinin". Vaccine. 25 (19): 3871–8. doi:10.1016/j.vaccine.2007.01.106. PMID 17337102. 1 2 Racaniello, Vincent (Dec 2009). "Influenza virus growth in eggs". Virology Blog. ↑ Izzat, Fakhrul (Apr 2012). "Viral Cultivation in Chicken Embryo". Youtube. 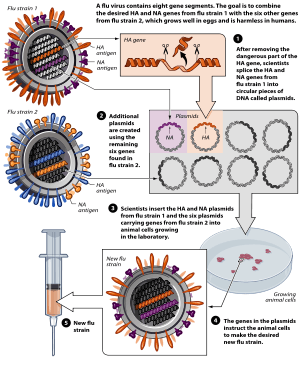 1 2 "How Influenza (Flu) Vaccines Are Made". Centers for Disease Control and Prevention. May 2014. ↑ Brown, David (2008-02-18). "Keeping ahead of flu comes down to guessing game". Knoxville News Sentinel. The Washington Post. Archived from the original on 2009-01-11. Retrieved 2015-12-22. ↑ WHO | Recommended composition of influenza virus vaccines for use in the 2016 southern hemisphere influenza season. ↑ Webster, Robert; Walker, Elizabeth (2003). "Influenza". American Scientist. 91 (2): 122. doi:10.1511/2003.2.122. ↑ Blakemore, C. (2006-04-09). "Battle of time, luck and science". The Sunday Times. London. Retrieved 2006-06-22. ↑ Hilleman, M (19 August 2002). "Realities and enigmas of human viral influenza: pathogenesis, epidemiology and control". Vaccine. 20 (25–26): 3068–87. doi:10.1016/S0264-410X(02)00254-2. PMID 12163258. ↑ Valleron AJ, Cori A, Valtat S, Meurisse S, Carrat F, Boëlle PY (May 2010). "Transmissibility and geographic spread of the 1889 influenza pandemic". Proc. Natl. Acad. Sci. U.S.A. 107 (19): 8778–81. Bibcode:2010PNAS..107.8778V. doi:10.1073/pnas.1000886107. PMC 2889325 . PMID 20421481. ↑ Donaldson LJ, Rutter PD, Ellis BM, et al. (2009). "Mortality from pandemic A/H1N1 2009 influenza in England: public health surveillance study". BMJ. 339: b5213. doi:10.1136/bmj.b5213. PMC 2791802 . PMID 20007665. 1 2 "ECDC Daily Update – Pandemic (H1N1) 2009 – January 18, 2010" (PDF). European Centre for Disease Prevention and Control. 2010-01-18. Retrieved 2015-02-08. ↑ Widdowson, M. A.; Iuliano, A. D.; Dawood, F. S. (2014). "Challenges to global pandemic mortality estimation". The Lancet Infectious Diseases. 14 (8): 670–672. doi:10.1016/S1473-3099(14)70835-7. PMID 25056013. ↑ Plotkin, S.L. and Plotkin, S.A. "A short history of vaccination." In: Vaccines, Stanley A. Plotkin, Walter A. Orenstein, Paul A. Offit, eds. Elsevier Health Sciences, 2008, pp. 6–7. ↑ Artenstein, A.W. "Influenza" In: Vaccines: A Biography Andrew W. Artenstein, ed. pp. 191–205. ↑ Hampson AW (2008). "Vaccines for Pandemic Influenza. The History of our Current Vaccines, their Limitations and the Requirements to Deal with a Pandemic Threat". Ann Acad Med Singap. 37: 510–7. ↑ USFDA FDA approves first seasonal influenza vaccine manufactured using cell culture technology. November 20, 2012. ↑ USFDA FDA approves new seasonal influenza vaccine made using novel technology. Jan. 16, 2013. ↑ Landry, Nathalie; Ward, Brian J.; Trépanier, Sonia; Montomoli, Emanuele; Dargis, Michèle; Lapini, Giulia; Vézina, Louis-P. (2010-12-22). "Preclinical and Clinical Development of Plant-Made Virus-Like Particle Vaccine against Avian H5N1 Influenza". PLOS ONE. 5 (12): e15559. Bibcode:2010PLoSO...515559L. doi:10.1371/journal.pone.0015559. PMC 3008737 . PMID 21203523. Retrieved 14 May 2013. ↑ CDC report Prevention and Control of Influenza published April 12, 2002. ↑ Osterholm, Michael T. (2005). "Preparing for the Next Pandemic". New England Journal of Medicine. 352 (18): 1839–42. doi:10.1056/NEJMp058068. PMID 15872196. ↑ McCullers JA, Van De Velde LA, Allison KJ, Branum KC, Webby RJ, Flynn PM (June 2010). "Vaccinees against the 1976 "swine flu" have enhanced neutralization responses to the 2009 novel H1N1 influenza virus". Clin. Infect. Dis. 50 (11): 1487–92. doi:10.1086/652441. PMC 2946351 . PMID 20415539. ↑ Brownlee, Shannon (1 November 2009). "Does the Vaccine Matter?". The Atlantic. Retrieved 8 December 2014. ↑ Jit, Mark; Newall, Anthony T.; Beutels, Philippe (1 April 2013). "Key issues for estimating the impact and cost-effectiveness of seasonal influenza vaccination strategies". Human vaccines & immunotherapeutics. 9 (4): 834–840. doi:10.4161/hv.23637. PMC 3903903 . PMID 23357859. ↑ Postma, M.J; Baltussen, R.P.M. ; Palache, A.M; Wilschut, J.C. (2006). "Further evidence for favorable cost-effectiveness of elderly influenza vaccination". Expert Review of Pharmacoeconomics and Outcomes Research. 6 (2): 215–27. doi:10.1586/14737167.6.2.215. PMID 20528557. ↑ Newall, AT; Kelly, H; Harsley, S; Scuffham, PA (2009). "Cost Effectiveness of Influenza Vaccination in Older Adults". PharmacoEconomics. 27 (6): 439–50. doi:10.2165/00019053-200927060-00001. PMID 19640008. ↑ Newall, AT; Viboud, C; Wood, JG (2009). "Influenza-attributable mortality in Australians aged more than 50 years: A comparison of different modelling approaches". Epidemiology and Infection. 138 (6): 836–42. doi:10.1017/S095026880999118X. PMID 19941685. ↑ Newall, Anthony T.; Dehollain, Juan Pablo; Creighton, Prudence; Beutels, Philippe; Wood, James G. (4 May 2013). "Understanding the Cost-Effectiveness of Influenza Vaccination in Children: Methodological Choices and Seasonal Variability". PharmacoEconomics. 31 (8): 693–702. doi:10.1007/s40273-013-0060-7. ↑ Newall, A.T.; Scuffham, P.A (2011). "Uncertainty and variability in influenza cost-effectiveness models". Australian and New Zealand Journal of Public Health. 35 (6): 576; author reply 576–7. doi:10.1111/j.1753-6405.2011.00788.x. PMID 22151168. ↑ Gatwood, J; Meltzer, MI; Messonnier, M; Ortega-Sanchez, IR; Balkrishnan, R; Prosser, LA (2012). "Seasonal Influenza Vaccination of Healthy Working-Age Adults". Drugs. 72 (1): 35–48. doi:10.2165/11597310-000000000-00000. PMID 22191794. ↑ Newall, Anthony T.; Jit, Mark; Beutels, Philippe (August 1, 2012). "Economic Evaluations of Childhood Influenza Vaccination". PharmacoEconomics. 30 (8): 647–660. doi:10.2165/11599130-000000000-00000. ↑ Newall, A.T.; Wood, J.G. ; Oudin, N.; MacIntyre, C.R. (2010). "Cost-effectiveness of pharmaceutical-based pandemic influenza mitigation strategies". Emerging Infectious Diseases. 16 (2): 224–230. doi:10.3201/eid1602.090571. 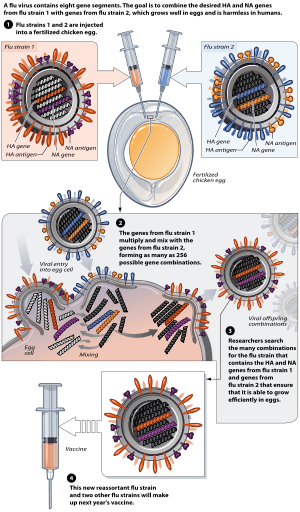 ↑ "Influenza Genome Sequencing Project – Overview". National Institutes of Health – National Institute of Allergy and Infectious Diseases. Retrieved 27 May 2013. ↑ Lampos, Vasileios; Yom-Tov, Elad; Pebody, Richard; Cox, Ingemar J. (2 July 2015). "Assessing the impact of a health intervention via user-generated Internet content". Data Mining and Knowledge Discovery. 29: 1434–1457. doi:10.1007/s10618-015-0427-9. ↑ "First Quadrivalent Vaccine Against Seasonal Flu Wins FDA Approval"
↑ "FDA approves first quadrivalent vaccine to prevent seasonal influenza"
↑ "December 14, 2012 Approval Letter- Fluarix Quadrivalent"
↑ McNeil, Donald G. Jr. (May 2, 2006). "Turning to Chickens in Fight With Bird Flu". The New York Times. ↑ Yen, Hui-Ling; Joseph Sriyal Malik Peiris (21 June 2012). "Virology: Bird flu in mammals". Nature. 486 (7403): 332–333. Bibcode:2012Natur.486..332Y. doi:10.1038/nature11192. PMID 22722190. Retrieved 27 May 2013.